I knew it would be close but I never let myself believe that I would be the one to miss out! It’s been a year since I joined Artemis Academy taking over their Mini and a very busy one at that. I knew it was going to be full on and I was ready for the challenge. In order to enter for the Mini Transat you need to have completed 1,000 race miles, one of which has to be over 500 miles and another solo. As well as race miles you must also complete a 1,000-mile solo passage. Once you’ve completed both you can join the entry list. Your miles are linked to you and the boat, so those who have raced the previous season are already qualified. Having only just started sailing the Mini I started with a grand total of 0 miles – while others were already qualified! I looked through the calendar and made a plan to finish my qualification process in the quickest possible way. This meant a trip to Italy and the Mediterranean (such a shame!). If I had chosen the Atlantic version I would have qualified 1 month later and risk being even further down the list. It was a busy calendar, a winter in Cowes with boat work and training, 6 weeks in Lorient for more boat work and an electric refit, then straight down to Italy for 2 races and my 1300 mile non stop solo. No time for any solid training, and definitely no time for mistakes. On 7th May I finished the Solent UK, and in doing so completed my 1000 race miles required to qualify. Having completed my qualification miles I joined the entry list, 13th on the waiting list, and the waiting game begun. Having qualified I was keen to increase my practise miles and time on the water, competing in the UK Fastnet and the Trophee Marie Agnes Peron. Due to budget I was unable to compete in the French Mini Fastnet on my boat. As I was already in France after the MAP I decided to jump ship and I sailed with French skipper Tom Guilbaud with him on his proto. Returning from France I went into full Artemis Figaro mode for the summer with lots of corporate sailing, while working on the mini in my spare time, with a mix of boat work and sponsorship hunting. The beginning of August saw the start of the RORC Rolex Fastnet, double handed on the Figaro with Charlie Dalin. A tough race, with a mix of conditions and tactical decisions taking into account the new rules on the traffic separation schemes. It was a very competitive race; we were never more than 2 miles from another competitor. Charlie and I fought hard to stay at the front and come away with the Figaro bullet. With the Fastnet over and under 2 months to the start of the Transat I went into full Mini mode. Finishing off all boat work and preparing to leave for France, while still looking for that magic sponsor. I wanted to get out to Douarnenez as soon as possible and get in as much practise against the other Minis and in the starting bay. At the end of August, DMS – Pack It In agreed to support my Mini Campaign and became title sponsor for the Mini Transat 2013. A huge thank you to DMS, with budget worries now behind me I could now focus entirely on preparing for the big race. September 12th – now 2nd on the waiting list, I set off for Plymouth and the official naming ceremony for PACK IT IN! with DMS and legendary sailor Pete Goss. September 13th was the day I’d been looking forward too since qualifying back in May. The last day you can drop out and still get your entry fees back. For me this day was the day I would gain my place – lucky 13. The Transat was to start on 13th October, at 13:13, I started at 13th on the waiting list and 13th September was the drop out day. The day came and went and I was still 2nd on the list – absolutely gutted. My ambitions and dreams were so close but so far at the same time. Regardless of still being on the waiting list I left for France and prepared the boat and myself for the start. It was a tough time for me, being at the start ready to go and being around everyone else who was so hyped up for leaving – yet I still didn’t have my place. The day before lock in arrived and there were still 15 odd boats not in Douarnenez, things were looking up. If they missed the lock in, perhaps I would gain a place? All 84 boats arrived in the nick of time and that was it, every day it was looking less likely that I’d get a place. By now all competing boats had moved into the race marina and I was on my lonesome with the 3 other waiting list boats on the other side of the river, completely excluded from the race village. Everyday was an emotional rollercoaster I could wake up in the morning thinking there was no chance of a place, dealing with it and getting on. I’d hear rumours of boats dropping out and the chance of me moving up, my hope would be restored, then only a few hours later realising that I still wasn’t going. Motivation and moral was at an all time low, but I stayed waiting in hope that maybe my time would come. I had spectators come up to my boat wishing me good luck for the race, others asking why I wasn’t with the other boats. Some making jokes at my expense. One of the tow boats even came over and told me it was my turn to get towed over to the other marina, after explaining I wasn’t allowed, he exclaimed he knew and he was only joking! Perhaps I don’t understand French humour yet? I attended all the briefings although not invited, and made sure my boat was ready to go – just in case I got the go ahead. Having not been through security and safety checks, measurement or medical tests it was becoming clear that there was no chance of a place for me. As the start got closer, the forecast was looking horrendous with a massive low-pressure system rolling into the Bay of Biscay. At this point, even if someone did drop out the organisation wouldn’t fill spaces with the waiting list, fewer boats meant less risk and was a bonus. Although I’d lived the year knowing I might not get a place, learning it was a devastating blow. Everything I’d worked for all year, I’d managed to qualify to schedule, the boat was ready to go, I was ready to go, I’d found my magic sponsor. Everything was set – I’d done everything I needed to do to make it, but now it was out of my control. It’s been an amazing year – I’ve pushed the boat and I to our limits, spending 10 1/2 days at sea by myself, taking on 45 knots for two days, living in a van and the mini for months on end, sleeping to the smells of petrol and resin. While I’ve been through tough conditions, the hardest part of the year was only last week, when I had to leave France the day before the Transat start to bring the boat back and return her to Artemis. Peeling off every piece of DMS branding and all the names of the people who helped me get this far. Not only was I devastated not to be on the line, I felt disappointed for those who were looking forward to following my race. Regardless of not getting a place I’ve had an unbelievable year and have learnt a lot that will help me moving forward. I’m now back in the UK on the job hunt, while looking at logistics and plans for a successful 2015 campaign. Unfinished business – I will be back, fighting, stronger than I was before, it’s not over yet. Disc Manufacturing Services Ltd (DMS) announced as title sponsor for Mini Transat 2013, starting on 13th October 2013 in Douarnenez, France. DMS specialise in plastic free packaging, as one of the UK’s leading CD, DVD and Vinyl and Plastic Free Packaging suppliers. Pack It In! aims to raise awareness of and reduce the damage caused to the world’s oceans by waste plastic. The boat was officially named DMS by legendary British sailor Pete Goss, a great honour to both the boat and myself. I read Pete’s book at a very young age and it was what originally inspired me to try offshore sailing. A great day for all involved down in Plymouth, and a huge thank you to all of you for being so welcoming. Today brings the exciting news of a new product sponsor to my campaign, Stowaways Foods. Stowaways provide convenient, easy to prepare hearty food for outdoor people, easy to stow and no fridge or tin opener needed – perfect for Mini life!! I will be experiencing a selection of their kitchen during my journey across the Atlantic. Having only tried a couple before I’m keen to give the rest of the menu a go. As the meals are pre cooked “cooking” them is simple. All I will need to do is place the whole pouch in my jet boil and watch it heat up! Nom nom nom! Stowaway Foods will be at the Southampton Boat Show, where you ask them any questions about their products, and possibly even give them a try! Buy your own now and get 20% off with this code: RYA20! BACK IN THE UK ! It’s been very busy since I arrived back from Douarnenez 2 weeks ago but somewhat different busy to what I’m used too. I arrived back in Cowes at 3am Friday morning after a 2 day, cold wet and foggy delivery back. I was woken early by the chatter and noise from a postponed IRC Nationals fleet and got on with sorting the boat and making plans for the next few weeks and catching up with the Artemis guys in the office. I joined the J97 team on Chaz Ivill’s Jiggery Pokery for the remaining days of the IRC Nationals. With little wind all weekend it was a challenging event, but great fun none the less. Turns out they were my shortest races this year by around 120 miles!! Corporate sailing was next on the cards for me, with a fun filled day of racing with the guys from Pol Roger Champagne. We were definitely blessed with champagne sailing conditions and managed to squeeze in 5/6 friendly races. With only a little bit of commotion (we definitely didn’t pick up the pin end marker on the rudder) the day was a great success and hopefully my team had a great day – thank you to Tim, Tim, Alex and Rob. The end of the week saw more corporate but this time for OC Sport, who not only run and organise the Artemis Academy but also the Extreme Sailing Series, Geneva Marathon, Haute Route, among manny other exciting events. We trundled down to Yarmouth, leaving cowes around 9 O’clock with 6 Figaros, 5 Sunsail First 40’s and the big 65ft Albatross from UKSA. Once arrived everyone got to experience sleeping aboard, some even attempted to sleep under the stars – in preparation for the big race around the island the next day!! Other than corporate I have been plugging away at the jobs list for the Mini and looking for sponsors, with only 85 days left till the start of the Transat, there isn’t much time. Particularly as I have two weeks away working for Cowes Week, then the famous Rolex Fastnet Race straight after. I’ve been supported by the Artemis Offshore Academy so far, who have funded me to get qualified and provided me with a boat. Unfortunately now I need to raise 20k to get to the start line in October. A massive thank you to everyone so far who has been so generous, it’s greatly appreciated and one step closer to my dream. Thursday 13th June saw the start of the MAP, a 220-mile solo race starting in Douarnenez. 73 boats started the race, of which 48 are competing in the series class. Douarnenez is where the Mini Transat 2013 and 2015 start will be, the MAP provided the perfect practise run. We started in 15-20 knots; with a beat out the bay against the tide, rock hoping close into the shore, dodging between boats, I had a great battle with some of the top sailors in the fleet. I’d love to see my track and be able to see just how close I got so some of the rocks and wrecks. I studied the charts thoroughly before the start, as I knew I’d be too busy to be able to look while racing. The tide spun just as we reached the Raz du Sein, I chose to sneak into the bay between the headland and the Raz du Van headland to try pick up the early favourable tide. Unfortunately it didn’t pay off, potentially due to the swell? It’s highlighted to me just how important it is to learn the local effects. After the Raz du Sein we headed toward La Groix, the wind died off and conditions changing constantly. I must have used every sail on the boat before midnight. I struggled to stay awake through the night. I plan to test various sleep patterns before the transat. Usually I have no problem staying awake in a race, but I tend to get very little sleep in the week commencing, either due to final prep or work commitments. This race I was very prepared and managed to bank a lot of sleep, and seemingly got too used to it!! Maybe I’ll start my race sleep patterns a week early for the transat! Anyway, back to the race…. It was upwind from La Groix up to Birvideaux, I rounded around 11:30, hoisted the kite and headed back for Douarnenez. The way back was a sleigh ride with winds up to 34 knots, which was slowly clocking round to the west. I flew the Code 5 most the way, but was forced to drop 15 miles from the Ouest du Sein to make the layline. Once around we headed back into Douarnenez bay with a few markers across. The first was dead down wind; the chop when I first rounded was very unpredictable so I held back from hoisting the kite. Once it had settled down I hoisted I stormed N towards Basse du Lis, 18 miles away. I saw 34 knots and managed to hit 17.6 knots of boat speed on the way down. AMAZING! Approaching the mark I dropped the kite and made a good rounding around preparing for the fetch (100 degrees TWA) across to the South side of the bay. With a 3rd reef now in the main, life was pretty full on. The final leg of the race was from Basse Veielle back to the Douarnenez entrance, 8 miles dead down wind. The wind was still up at 25-30 knots – I hoisted the Code 5, and gybed my way East towards the line, managing to overtake a number of boats in the last couple miles. I’m disappointed with my performance on the first night and how much I lost after rounding the Raz. However I’m very happy with how much I managed to pull back on the 2nd day in the breeze. Next up for me is the Mini Fastnet, starting this weekend from Douarnenez. We head North to the Fastnet Rock via Wolfe Rock and then back to Douarnenez. For this race I will be sailing on Proto number 427, with a French guy Thomas who usually sails from Lorient. I’m really looking forward to the opportunity to play with swing keels and daggerboards. It’s been nearly two weeks since my last race, the UK Fastnet. Unfortunately due to a damaged tiller I decided to retire from the race during the first night just 10 miles off the Lizard. Although I could have made a bodge repair, due to the conditions and expected forecast, I decided the safer option was to return to Plymouth. This was to minimise the risk to the boat, as well as Lizzy and I, something of great importance when heading out into open water, in this case the Irish Sea. Having had time to reflect on my decision I stand by it and still think it was the best thing to do…although hearing the epic stories from the race I secretly wish I got live them myself – I’m a great fan of heavy weather survival sailing. Perhaps that’s what attracted me to the Mini!! My next race the Marie-Agnes Peron Trophey (MAP) starts on 13th June in Douarnenez, France, the starting town of the Mini Transat 2013 this October. The race is 220 miles solo, and with over 80 boats entered it will great practise for the Transat itself. I’m really looking forward to racing in France, having spent the year racing in the Med and the UK. The Atlantic fleet is much more competitive and will be a real measure of where I stand in the fleet ahead of the Transat. Having sailed over 2,000 miles in my Mini this year I know the boat really well. I’ve had some good races this year already, and I’m very keen to put my experience to practise and see where it gets me in such a big fleet. This will be my 2nd ever solo mini race, and having not sailed my Mini solo since my qualifier back in March I’m very excited to get back in and see what I can do! After the MAP I will compete in the Mini Fastnet, also starting in Douarnenez. Unfortunately due to my budget I won’t be racing the Artemis Mini. Instead I will be taking the opportunity to sail on a fellow Mini’ists Proto. Next year I hope to get my own Proto so it makes sense to get some experience to see if it’s really for me. With canting keels, daggerboards lots of carbon and for some, water ballast and rotating rigs, life on-board can be somewhat more hectic than that on a series boat. Lets see if I’ve got what it takes!!! Between my races I’ve had time to switch roles and get back into the “office,” Thinking about the future, both the 2013 and 2015 Mini Transat. The Artemis Offshore Academy have funded me getting qualified and my racing so far this year and have provided me with the Mini. I need to now find an additional sponsor in order to make the Transat start this October. I’ve been busy the past week putting together proposals (watch out they’ll be on your doorstep soon!!). Coming up with ideas on how I can give something back and the benefits of supporting my campaign. I’ve got a 3-year plan in place, which is currently half a year complete. I’m now qualified for the 2013 Transat, having completed my 2,000 qualification miles this year and currently 13th on the waiting list. The Transat starts on 13th October 2013 at 13:13! 13 is definitely my new lucky number. One extra can’t hurt right?! The qualification deadline closes at the beginning of July and by then I should have a better idea of whether I will gain a place on the 84-boat start line in October. There are currently a few Proto spots untaken which could move across, otherwise I’m playing the waiting game and hoping for people to drop out. Beyond 2013 I am looking to get my own Mini, this time a Proto and start campaigning for the 2015 Mini Transat. Completing my qualification miles in 2014 and getting as much time on the water as possible in the new boat. By completing my miles a year early it means I can turn up to the Paris Boat show in December 2014, sign up and gain my place on the start line in 2015 instantly – avoiding being on the waiting list and the unknown. 17 Mini’s will set off from Plymouth today in search of the iconic Fastnet Rock. The course was changed yesterday and we are now going from Plymouth straight to Coningbeg then onto the Fastnet Rock, down to Bishop Rock then back to Plymouth, a total of 561 miles. The change was to allow a less brutal Irish Sea crossing. Rather than a hard beat all the way to the rock we will now have a one sided fetch just off the wind, at around 80 degrees twa (true wind angle). There is a massive low sitting in the Irish Sea which could spit anything at us. We’re all on for a bit of a beating with winds expected up to 35 knots. With the changing wind direction the sea will be very lumpy, not ideal conditions for the mini. We start at 1200 in about 20 knots, upwind all the way to Lands End via Eddystone Lighthouse. From there we go straight to Coningbeg a cardinal marker off the SE corner or Ireland. Afterwards we head towards the Fastnet Rock on the SW coast. The wind is due to swing North East by this point so we will be in full upwind mode, purely on starboard tack. Round the rock we will hopefully get the kite up for the first time and enjoy a downwind blast towards bishops rock. As we reach Bishop Rock and the Scillies a high pressure system will bring us light winds and we will most likely round in as little as 4 knots of breeze. A welcomed break by this point I imagine. With the wind filling in from the North we’re then on for another power reach back to Plymouth. With such testing conditions we’ve packed a large amount of food and special treats to keep energy and motivation high. A new edition to the mini this race is two hot water bottles – a hopeful attempt to keep us both toasty warm at night. With my iPod still broken from my qualifier we will be music less – I officially apologise to Lizzy now as I will start singing due to the lack of tunes very early on!! With recent changes to the ISAF rules and TSS’ there will be some interesting tactical decisions to make. We are required to cross the TSS (trafic seperation scheme) at 90 degrees or to avoid the system completely. The rules relating to Traffic Separation Schemes are enforceable in the courts for all vessels, including boats racing, and heavy fines can be, and frequently are, imposed for non-compliance. We potentially have 5 TSS’ to navigate through, Land’s End, just off Bristol, Fastnet Rock then two off Bishop Rock. Over the last couple days there has been great debate on what 90 degrees is, whether it’s your boats heading or your course over the ground. Where in the rules it states your heading, how one proves your heading is unknown to me with leeway and tide both effecting your course over ground. 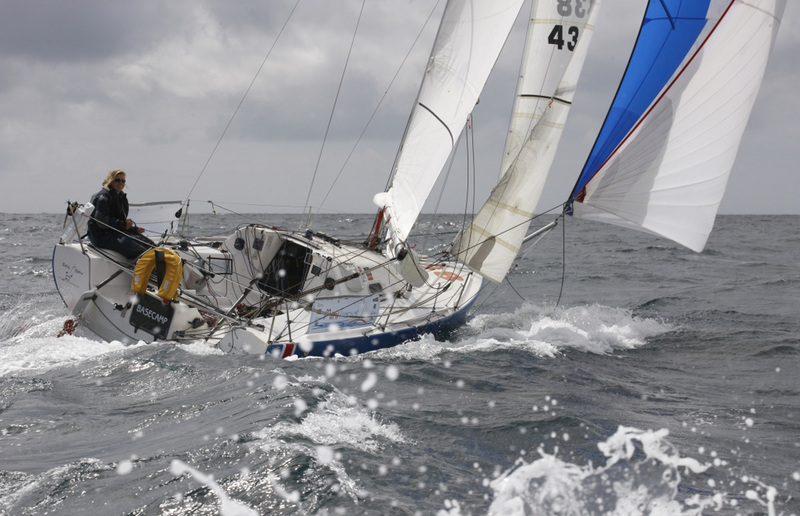 Many sailing races have brought in rules to require competitors to avoid the TSS’ completely. The Vendee Globe being one, of which 7 boats were given penalties in this years race due to infringements. Henry Bomby, Artemis Graduate and Figaro competitor wrote a brilliant article explaining it all in great details. Certainly an interesting race ahead.